The first and only seaplane training program in Poland officially approved on 2-nd September 2010 by the President of the Civil Aviation Office. 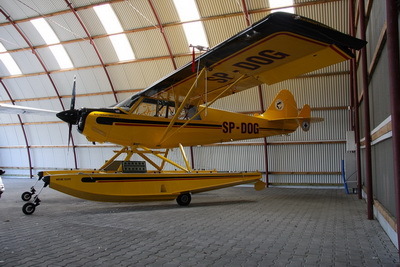 Airport Biernat is the first Flight Training Organization in Poland since the end of World War II, who officially received the certificate of authority for seaplane rating. It is also the first and only program of its kind in Eastern Europe. This is the lowest price of seaplane rating across Europe. Interested in training please complete and send application to the given address info@airport-biernat.pl. Currently, practical training takes place on an airplane Cessna 172 on floats, which was completely refurbished and extended in additional options that are not found in the standard version such as “bubble windows” for example.